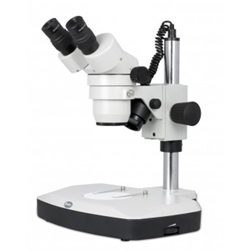 Motic SMZ140-FBGG and SMZ143-FBGG zoom stereo microscopes are on a larger base post stand with lighted top and bottom illumination. Objective Lenses: 1x - 4x zoom built-in objective provides continuous magnification. Viewing head rotates 360°. Eyepieces: Includes a pair of widefield 10x eyepieces. 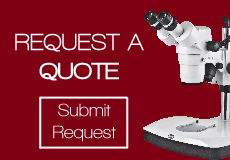 Additionally choose from optional paired widefield 5x, 15x, 20x, or 30x eyepieces that are 45° inclined, with dual diopter adjustments, interpupillary adjustment from 55mm to 75mm. Accepts 23mm eyepiece reticle. Available in binocular or trinocular. The trinocular version has a beam splitter which directs light 100% to the eyepieces, or makes the right eyetube go dark and directs that light to the camera port. Total Magnification: Zoom range of the following: Please view the magnification chart above for full options. Stand: Post stand has built in top and bottom halogen illuminators (12v/10w). Each illuminator has its own intensity control and each operates independently of the other. Includes two stage clips. Vertical post is 300mm (11.8") tall. Maximum specimen height with no auxiliary lens is 203mm (8"). Focusing: Large dual focusing knobs with slip clutch to prevent damage to mechanism. Tension adjustment eliminates focus 'drift'. Illumination: Top and bottom lights are both 12v/10w halogen with intensity control and separate on/off switches.